I am slowly realizing that my current “room defines what is in it” approach isn’t going to cut it. Thankfully, I didn’t get very far with it or add too much code. The main reasons is me wanting to make my life easier designing rooms. I would like to specify as few things as possible by hand. 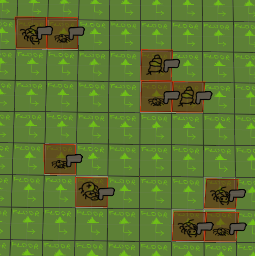 Perhaps locations where mobs spawn or props sit or loot can appear, but not actually how much and what kind for each room. 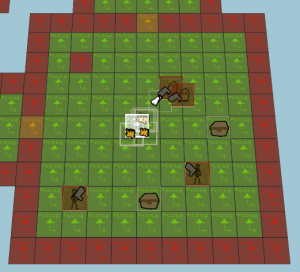 I don’t want to micro-manage decisions on a per-room basis, but have the higher powers of the dungeon determine what loot and mobs and whatnot are necessary and then the rooms can place those things. 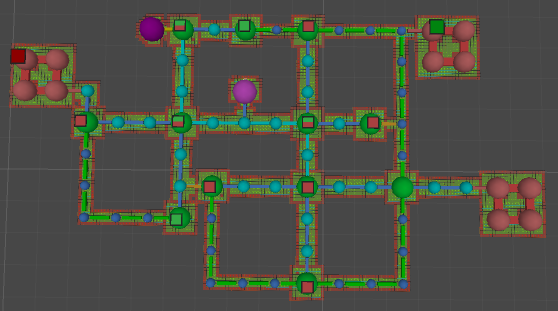 To sum up, I want to add a new dungeon generation layer that will “distribute gameplay-related stuff” around the dungeon. For example, my current level might require 60 mobs, 3 bosses, 20 loot items, and 1 artefact. And I might have 4 arenas and 10 hub rooms. So I can tell 3 of my arenas to have bosses and 1 to have an artefact, then sprinkle the mobs and loot in hubs or whatever. I’m thinking aloud here, so details will come as I write this entry. The takeaway point is that I can’t make such decisions on a room-by-room basis, because rooms don’t “know” that they need a boss and not an artefact spawned. The slider describes the proportion of available rooms for that content that will actually contain that content. 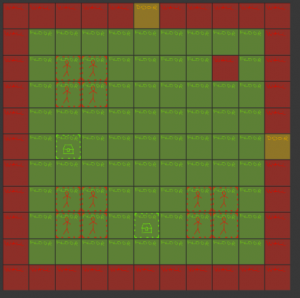 This means that if I have 100 rooms, 80 will be used for enemies and 40 for loot, of which 20 will be used for both. 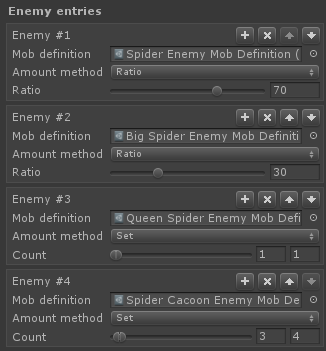 So this allows me to specify exactly how many rooms will contain each content (if any0 and how they will overlap (if at all). This has its limitations, but it should work fine for my purposes. So this distributes the content in the dungeon. 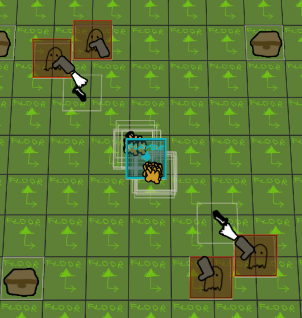 Now I can look at all these content spots and they will tell me exactly what they need, for example, 6 enemies and 3 loot items. 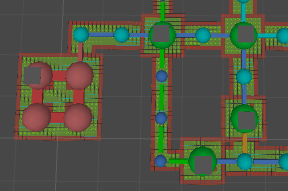 The spots also reference the node(s)/room(s) they were made for, so I know which room(s) will need to accommodate these. So now I can go back to the actual rooms (definitions) and specify the locations for room-independent content. I no longer care to specify anything more about this content — not how many there are, not the enemy strengths or loot amounts, etc. This will now be provided by the content generation and the room just needs enough empty spots to place that content, whatever it is. 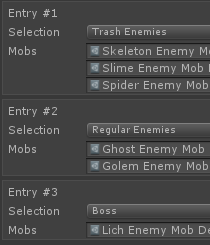 And this isn’t the “correct” content yet — I don’t specify which enemy types and kinds of loot I want. The big thing about my room design was choosing a particular enemy theme or strength for each room, so I don’t get silly mixes of stuff (like above). 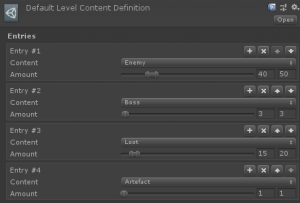 For that I need to go back to an earlier content generation step and consider how I choose which rooms get which specific content. And whether I want to distribute that as well in some way. 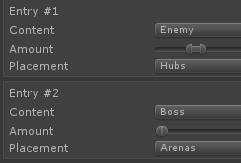 This will have to be on a content-basis, that is, I cannot select enemies or bosses the same way as I select loot, and the player doesn’t get selected at all. The green area is where the “close” nodes are, everything else is “far” nodes. 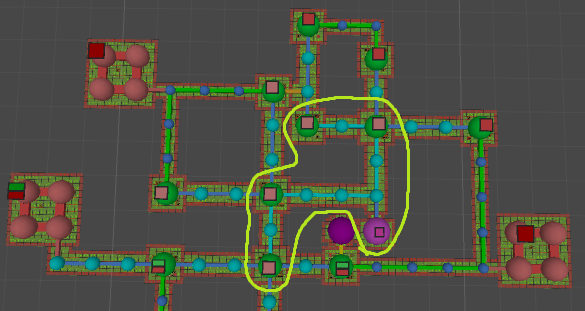 Of course, with stuff branching and splitting, it’s not exact, but this isn’t supposed to be. This is all getting quite convoluted, but I think it makes sense when broken down into steps. Most importantly, it lets me tweak things with a few values at the very highest level of detail and then it all auto-magically propagates throughout. And while all the steps are closely interlinked (and will fail horribly if something is missing), nonetheless any of the steps can be modified separately.